Sprawling acres of lush green vines, freshly-curated wine and a glistening lake can only mean one thing: The Vineyards at Pine Lake. Family-owned and located in Columbiana, this stop on the Wines of the Valley Wine Trail is bustling with energy during its busiest time of year, harvest season! And today we’re traveling behind the vines with a look at the harvest process and VPL’s upcoming Harvest Festival. 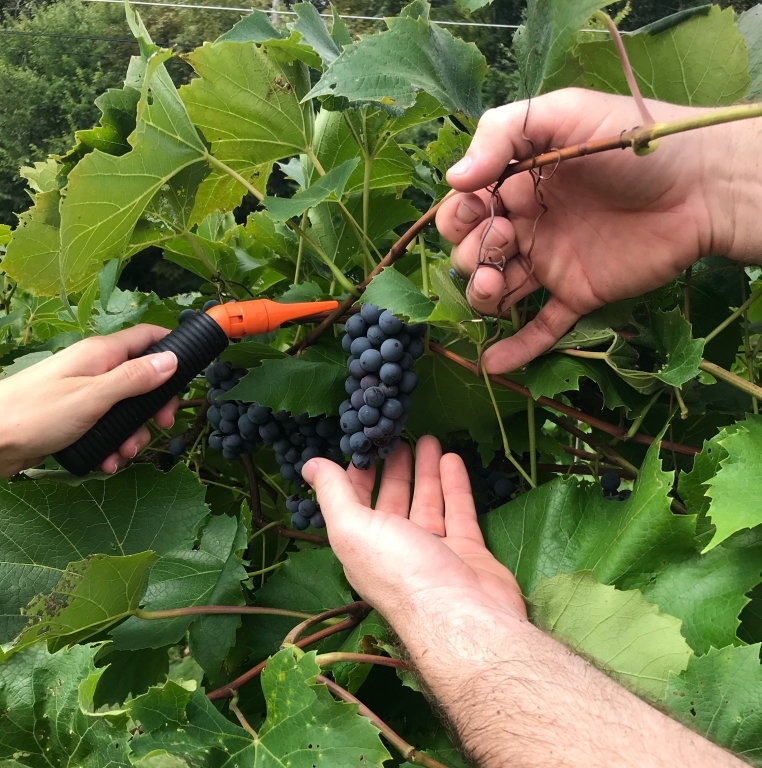 Starting in the last week of August, Joe and his crew headed to VPL’s 4.5 acres of vines for the first step in wine harvest: collecting the grapes. With “grape forks” in hand, the team cut the grapes from their stems, dropped them into buckets and sent them off to the crusher. Watch the video here. Over 15 tons of grapes eventually make their way to the crusher and de-stemmer machine, located on VPL’s crush pad. The machine pulls the grapes through rubber rollers that squish out the juice and send the remnants down to the de-stemmer. The end result? Grape material ready for fermentation and stems ready for the compost pile. See the machine here. Once the grapes are smushed and separated from their stem counterparts, it’s time to ferment. Joe adds a sugar and water mixture to increase the sugar levels. He then adds tempered yeast to the bin and lets it convert the sugar to alcohol. Watch the video here. As the yeast does its job, the grape skins and stems (aka the “cap”) float to the top of the bin. Why? Because the added yeast releases CO2 gasses, causing the material to float. Thus in order for red wine to have the right color and flavor, Joe must press down the skins using something called a punch down tool. See how it’s done here. This step in fermentation involves adding beneficial bacteria that converts malic acid into a much smoother and easier-to-drink lactic acid. Watch it added here. 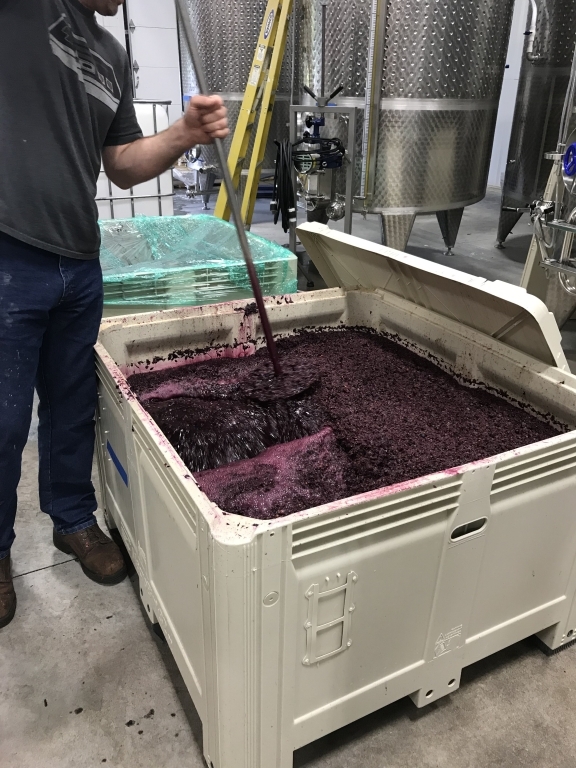 Once the flavors are right, the wine and grape mixture is shoveled into VPL’s bladder press. This machine pushes the grape skins to the outside and drains the wine into a collection bin. The grape material is collected in a bag and the wine travels into a massive tank. See the machine here. Note: this is the last video posted, but not the last step in winemaking. Check back to VPL’s Facebook page in the next few weeks for the rest of the process. If you’re like us and thinking “this is awesome, how do I see more? !” You’re in luck! 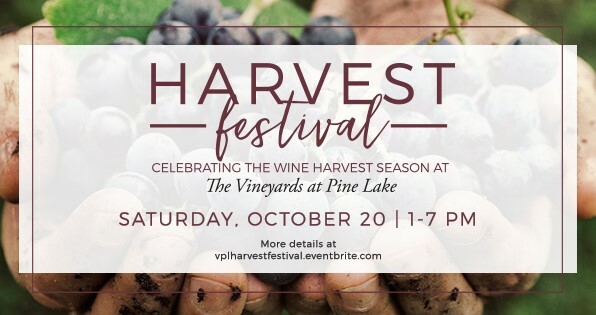 On Saturday, Oct 20 from 1-7 p.m., The Vineyards at Pine Lake is offering the ultimate wine harvest experience at their first-ever Harvest Festival. What’s Happening at Harvest Festival? Although admission to Harvest Festival is free, you won’t really get the full wine harvest experience unless you grab tickets to one of the event’s interactive sessions. And in our opinion, they’re more than worth the price. Bringing a date? Reserve tickets for the Vine to Bottle Tour, which includes wine tastings, for just $15/person. You can choose from two different tour times, starting at either 2 p.m. or 5:30 p.m. Have kids? Grab tickets to the Parents Wine Blend Class for $20/adult and your kids get to create a dessert with VPL’s Executive Chef for free. All ticket details and links can be found at vplharvestfestival.eventbrite.com. This harvest season, take advantage of this beautiful vineyard located in southern Mahoning County! And when you visit, don’t forget to bring your Wines of the Valley passport, purchase a glass of wine and earn your stamp and wine charm. Looking for more winery events in Mahoning County? Visit our Facebook page or take a look at the Mahoning County Convention & Visitors Bureau website!